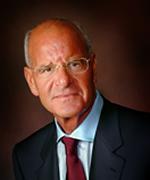 2012 was a good year for UPMC’s top brass. UPMC CEO Jeffrey Romoff got a $90,000 raise, making Romoff one of the most highly compensated not-for-profit hospital CEOs in America. His total compensation at the health system tops $6 million, nearly two and a half times the CEO compensation of the Cleveland Clinic, next highest grossing nonprofit health system in the US. UPMC’s millionaire’s club welcomed some new members too jumping from 22 top earners at UPMC receiving packages at or above $1 million in 2011 to 27 today while thousands of UPMC frontline workers struggled to make it on poverty wages – some even having to rely on public assistance to make ends meet. According to data from the state Department of Public Welfare, UPMC has the third-highest number of full-time workers on Medicaid assistance in Pennsylvania, just behind Wal-Mart and McDonalds. The $47.5 million in compensation paid to executives making more than $1 million a year represents 49 percent – nearly half! – of the $96.2 million the hospital system claims to have spent on charity care. 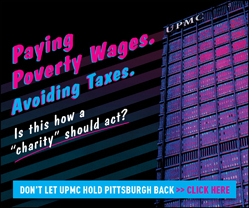 Even under UPMC’s convoluted definition of what it claims to be “charity care,” UPMC spends less than 2 percent of net patient revenue on charity care, and charges the highest rates among Pittsburgh hospitals for many routine treatments. Yet the hospital giant continues to make millionaires of those at the top. 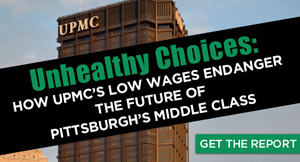 Lavish executive pay and highest prices in the city for treatment while spending little on charity care: is that how our region’s biggest employer and health care provider, a designated nonprofit “purely public charity” should act? Look below to see who’s making millions at UPMC. Source: UPMC 2011 990 filing, pages 304-312. Correction – Romoff is the most highly paid CEO of a not-for-profit hospital… Of course, not every NFP hospital also runs their own insurance racket! Jim Staus vs. UPMC from Phinehas Hodges on Vimeo.